My mother-in-law gave us this antique vase. She loved the elegant little gaping mouth fish and so do we. But we have never found details of the registration number that matches the maker. 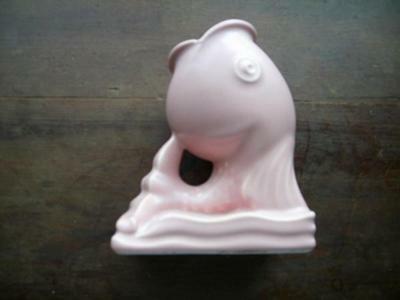 We are so curious about the origins and value of our little pink fish antique vase. We used to use the vase as a toothbrush holder until we thought better of taking it for granted. Now this antique vase is perched up high and safe to keep it in perfect condition. The Antique Vase is marked 444 on the bottom and I would really appreciate any help or assistance in discovering more about it. Bonjour Staphanie your antique fish vase is probably made by ABINGDON ART POTTERY. There is also an Abingdon Pottery which was established in 1908 by Raymond Bidwell. It began manufacturing in 1934 as the Abingdon Sanitary Manufacturing Company. Have a nice day, Paulin.